A medical miracle made of metal helped polio sufferers to breathe in the 1900s. The tank respirator, or iron lung, reads like a medical curiosity in modern times thanks to vaccines for the polio virus created by Jonas Salk and Albert Sabin in the 1950s and 1960s. But prior to that, for the nearly one in every 200 patients infected with the virus that suffered paralysis, including of the respiratory system, it was the surest way to survive until they could recover and breathe again on their own. The iron lung was born in 1927, when Philip Drinker and Louis Agassiz Shaw at Harvard University devised a machine that could maintain respiration, pulling air into and out of the lungs by changing the pressure in an airtight metal box. It was powered by an electric motor with two vacuum cleaners. Inventor John Emerson ran with the idea of Drinker’s device, creating a lighter, cheaper-to-manufacture, more reliable metal tank equipped with a sliding bed — called a “cookie tray” — and portal windows that allowed attendants access to the chamber. 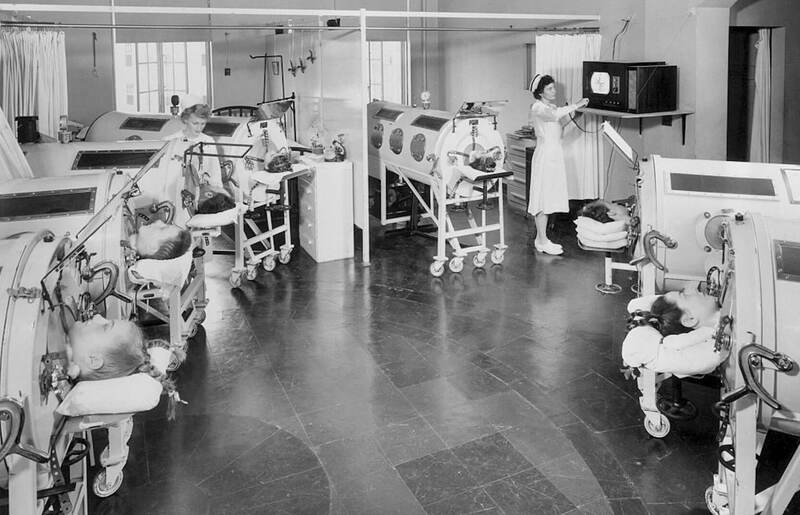 Polio had taken such hold that mass distribution of iron lungs began in 1939. In 1952, a record 57,628 cases of polio were reported in the U.S. In 1959, 1,200 people were using iron lungs in the U.S. alone. Since 1988, thanks to the vaccines, there has been a 99 percent decrease in polio cases worldwide. Yet, in the last two years, the World Health Organization declared that a revived spread of polio is “a public health emergency of international concern” as vaccination efforts have been thwarted by militant groups such as Boko Haram’s activity in Nigeria.